$5 before 11:30pm, say LETICIA'S LIST at the door! 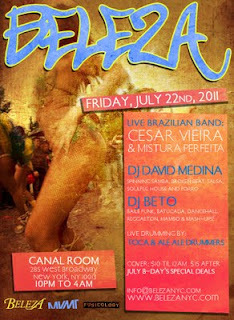 *DJ David Medina spinning Samba, MPB, Afro Brazilian, Axe, Salsa, Forro all the world music. *DJ Beto spinning Baile Funk, Batucada, Dancehall, Reggaeton, Mambo & Mash-ups!!! *SPECIAL performance by: ALE ALE DRUMMERS and JUSTIN JUSTIN "aka TOCA"
*First hour drink specials: Caipirinhas and Mojitos!!! *If JULY is your birthday month – Facebook(http://www.facebook.com/ev​ent.php?eid=14801249191772​8) and let Beleza know – they’ll provide you some special treats and a birthday you wont forget!